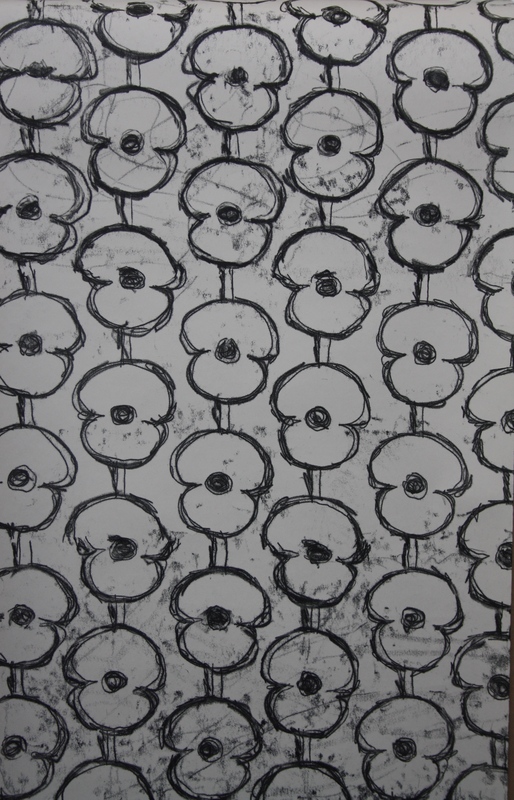 Over the coming days, BUMF will commemorate Remembrance Day by sharing work from Arts University Bournemouth students that is themed around World War 1 and Remembrance Day. In the first of a series of posts, MA Fine Art student Harry Shaw tells us about his practice and his piece ‘Wallpaper’. This print is simply titled Wallpaper. In my practice I often look at the connotations of wallpaper and how it can interact with, and change the atmosphere of a domestic space. With this piece which I developed at the end of 2014, start of 2015, I was thinking about the centennial anniversary of the the First World War and how I was expecting a lot more attention about it, programmes and documentaries on every week, films and books coming out, and so forth. These things did happen but not to the extent I had expected. I was also looking at floral patterns of wallpaper. One aspect was whether they are about being inside and wanting to be outside or being inside and having the outside at a safe and comfortable distance. Wallpaper has become synonymous with the bland and the over looked, and I felt that in my observation of the lack of greater attention given to this historical event I could link the two ideas through a similarity with being ignored. I created this piece by drawing into the back of lining paper, which is plain wallpaper, when it was resting on ink, this print technique is called mono printing. There will be a Guest Speaker in the Arts Bar at 11.10am on 11th November who will be relaying their family experience of both the First and Second World Wars with personal historical photographic documentation and memorabilia. Don’t forget you can pick up your Poppy in the Arts Bar.